San Diego’s subdivisions are cut out of hillsides as a result of local developers attempting to use every possible inch of land. This leaves homeowners to deal with some pretty tricky terrain. If your home is set on a slope, you’re faced with figuring out what to plant and how to control erosion when it rains. Just think of your sloping property as a garden at an angle. You can maximize the space using the right hardscape ideas for slopes. Here are some solutions to help you get your landscaping under control. To create a flat spot to put a garden or patio, you almost always need a retaining wall. This holds back the soil, controls erosion, and breaks up the slope. Retaining walls can be made of many different materials, from natural looking boulders to cleanly cut paving bricks to weathering steel plates that rust to a beautiful burnt orange color. Concrete, lumber, and cinderblocks are additional options for building retaining walls. For planting on steep slopes, you may need to break up the garden into multiple stepped layers you can work with, installing separate retaining walls for each one. This requires carving various flat spots out of the slope and building a strong wall to support the soil as you go. Then, you can grow different types of plants in each terrace you carved out. You can even install raised garden beds to create an even more layered look. If your sloped property is too restrictive, simply build above it! In this Modern Panoramic project we completed in San Diego, we drove piles into the sloped earth below and built a cantilevered deck over the slope. A glass railing system completed the beauty and safety of this sophisticated backyard with endless views of the valley. It’s easy to navigate a hill if there are stairs to walk up and down. These can be as refined or rustic as you want, from smooth bricks to roughly hewn pavers to giant stone slabs. You can even use railway ties and gravel to form steps in your sloped garden. Consider adding a handrail if necessary for extra stability when traversing the hill. When life hands you steep slopes, use them to create meandering paths with beauty rivaled only by their function. Wind the steps through rock retaining walls in a curving arc that creates a beautiful backcountry look. To create just the right aesthetic, you’ll need the exacting eye of a landscape architect to help with this project. When the soil starts washing away, your sloped garden begins to degrade. Slow this progression by installing plastic mesh on the slope. Fill the mesh with soil and plant grass, trees, and ground cover on top of it. The roots of these plants will further help to keep the soil in place. You may see your sloped property as an inconvenient problem that requires a solution. But what your children see is the world’s greatest slide. While you should still implement some of these hardscape ideas for slopes to slow erosion, you can always take advantage of the natural slant to install a slide for your kids to enjoy. You’ll certainly want to team up with a landscape architect to implement these hardscape ideas for slopes. That’s where Eco Minded Solutions comes in. 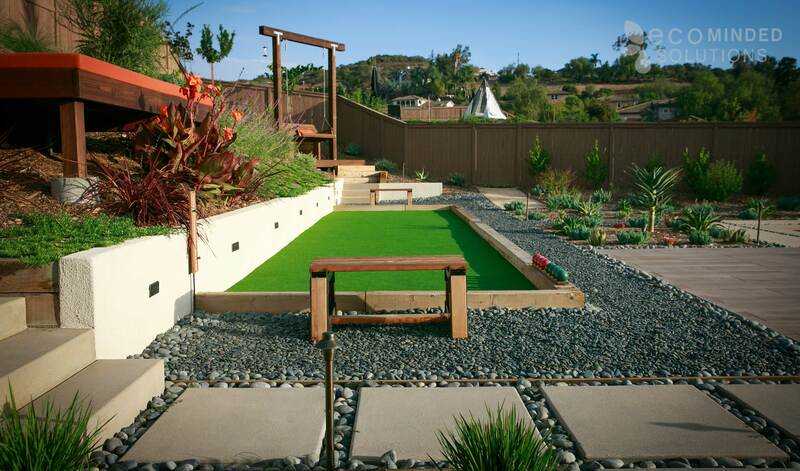 We provide hardscape design and installation services in the San Diego area. We’ll help transform a hazardous, erosion-prone property into a lovely terraced garden or deck. For more landscaping ideas, or to schedule a consultation, please contact Eco Minded Solutions today.